The impact created in 1852 by Harriet Beecher Stowe's novel Uncle Tom's Cabin made her one of the most widely known American women writers of the nineteenth century. Harriet Elizabeth "Hattie" Beecher was born in Litchfield, Connecticut, on June 14, 1811, into a family of powerful and very demanding individuals. Her father, Lyman Beecher, was a fiery, evangelical Calvinist (a strict religious discipline) who drove his six sons and two daughters along the straight and narrow path of devotion to God, to duty, and to himself. Much of her father's religious influence would show up in her writings as an adult. Her mother, Roxana Foote Beecher, died when she was four, leaving a legacy of quiet gentleness and a brother—the Beecher children's uncle Samuel Foote. Uncle Sam, a retired sea captain, brought a sense of romance and adventure into the household, as well as a measure of warm tolerance which might otherwise have been absent. In October 1832 Harriet's family moved to Cincinnati, Ohio, where the elder Beecher became director of the Lane Theological Seminary and where his older daughter, Catherine, opened her Western Female Institute, a school in which Harriet taught. She began to study Latin and the romance languages and made her first attempts at writing fiction, although her sister did not approve. In 1834 Harriet began writing for the Western Monthly Magazine and was awarded a fifty-dollar prize for her tale "A New England Sketch." Her writing during the next sixteen years was to be infrequent, for on January 6, 1836, she married Calvin Ellis Stowe, a professor in the Lane Seminary. They had seven children during a period of financial hardship. At the same time she had the opportunity to visit the South, and she observed with particular attention the operation of the slave system there. The atmosphere at the Lane Seminary was that of extreme abolitionists (those fighting to end slavery). Harriet herself did not at that time pursue this position. In 1849 she published her first volume, The Mayflower, a slender book, but one that convinced her husband that she should seriously pursue a literary career. In 1850 Harriet's husband Calvin Stowe was called to a chair job at Bowdoin College in Brunswick, Maine, where they had their last child. She then set about writing Uncle Tom's Cabin, which first appeared in serial form in 1851 through 1852 in the National Era, a Washington, D.C., antislavery newspaper. The book was published in 1852 in a two-volume edition by the house of John P. Jewett and sold three hundred thousand copies in its first year—ten thousand in the first week. During the first five years of its publication, the book sold half a million copies in the United States alone. gentleman, and the last the wicked Simon Legree, who causes the death of Uncle Tom. The fortunes of the slaves in the book curve downward, and the finally successful dash for freedom taken by George and Eliza makes up the high drama of the book. But the overall treatment of slave and master reveals something far more complex than abolitionist ideas: the high, clear style contains much that is warmly, even fiercely sympathetic to the world of the old South. Stowe answered her critics in 1853 with A Key to Uncle Tom's Cabin, a book designed to document the facts of the novel, but she also responded to her success by traveling widely, receiving praise in England and in Europe. In 1856 she published her novel Dred: A Tale of the Great Dismal Swamp. This, too, was a slave novel, and its reception was hardly less enthusiastic than that of Uncle Tom's Cabin. In England alone, during the first month, over one hundred thousand copies were sold. Although Stowe then turned to instructive writings, producing a series of novels based on New England and drawing heavily on local color, her reputation for years to come was connected with the instructional power of her first two novels. Indeed, when she was introduced to President Abraham Lincoln (1809–1865) in 1862, he is said to have exclaimed, "So this is the little lady who started our big war!" In 1869 Stowe again toured Europe, renewing an earlier friendship with Lord Byron's (1788–1824) widow. As a result, the novelist published Lady Byron Vindicated (1870), charging the dead poet with having violated his marriage vows by having a sexual relationship with his sister. Byron was a legend by this time, and the charges resulted in Stowe losing much of her loyal British audience. Undisturbed, however, she continued her series of novels, poems, and sketches, as well as her autobiography, never lacking a devoted and enthusiastic American audience. The later years of Stowe's life were spent, in large part, in Florida, where she and her husband tried, with only moderate success, to manage the income from her literary activities. Stowe died in Hartford, Connecticut, on July 1, 1896. 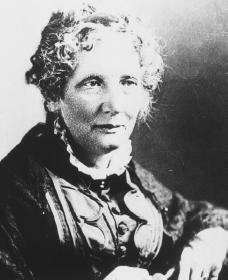 Harriet Beecher Stowe's personality and her work are mint products of her culture. They represent a special combination of rigid Calvinist discipline (fight against it though she tried), sentimental weakness for the romanticism of Sir Walter Scott (1771–1832) and Lord Byron, and a crusading sense of social and political responsibility. Fritz, Jean. Harriet Beecher Stowe and the Beecher Preachers. New York: G. P. Putnam's Sons, 1994. Wilson, Forrest. Crusader in Crinoline: The Life of Harriet Beecher Stowe. Philadelphia: J. B. Lippincott, 1941. Reprint, Westport, CT: Greenwood Press, 1972.